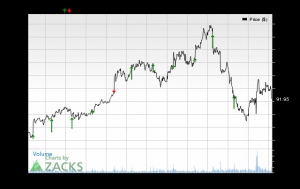 It couldn't have been a worse six months for Electronic Arts (NASDAQ: EA). The maker of best-selling franchises like FIFA and The Sims reported a disappointing third quarter. Due primarily to the weak performance of the company's flagship shooter Battlefield V, management now expects total revenue for fiscal 2019 (which ends in March) to be $4.875 billion, down from $5.15 billion in fiscal 2018. You would think that the news would have caused further volatility in the share price, but it didn't. Year to date, the stock has rocketed 33% off its recent lows. One reason for the stock's recent surge could be that the worst-case scenario is already priced into the stock's valuation. Another reason could be EA's latest game, Apex Legends, which just launched last week and could be the first real challenge to Fortnite's dominance. Apex Legends follows the successful formula of other battle royale games where players drop into a large in-game map and fight to the last one standing. However, Apex introduces a twist: a focus on squad-based gameplay, which distinguishes the game experience from other battle royale games, including Fortnite, that focus primarily on individual gameplay. So far, gamers are loving Apex Legends judging by the viewership on Amazon.com's Twitch. Apex has been attracting around 200,000 to 300,000 viewers per day, while Fortnite's viewership has mainly hovered under 150,000. 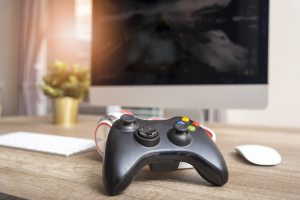 The level of Twitch viewership is not a perfect measure of engagement, but it shows which games in the market are attracting interest and, hence, are the most popular in the industry. Has Fortnite finally met its match? Nevertheless, EA investors shouldn't get their hopes up. After all, Activision Blizzard's Call of Duty: Black Ops 4 was beating Fortnite on Twitch last fall, but Activision's best-selling shooter couldn't sustain the momentum. Eventually, gamers drifted back to the cute, colorful world of Fortnite. Meanwhile, Activision and EA have issued disappointing guidance which sent share prices plunging in the last months of 2018. Investors have been quick to blame the soaring popularity of battle royale shooters. EA confirmed those concerns in its third-quarter earnings release, as sales of Battlefield V delivered underwhelming sales performance during the holiday quarter. CEO Andrew Wilson put the blame squarely on a competitive launch window in November. He also admitted that the company made a mistake in prioritizing a single-player experience in the game instead of focusing more on a multiplayer experience, such as a battle royale mode. However, as EA reported its third-quarter results, it quietly released Apex Legends. Not only does Apex offer its unique twist on the battle royale genre, but it's free to play. Gamers have to pay $60 to play Call of Duty: Black Ops 4, and that up-front cost is why it can take a big-budget game like Call of Duty or Overwatch a few years to reach a sizable player base. Fortnite's free-to-play model allowed it to reach 125 million players in a matter of months. The big game companies are never going to compete with Fortnite with the old model of selling games for $60 when users can play a polished, well-designed, and fun game for free. It's clear EA is already figuring this out with Apex Legends. Apex could be Fortnite's first real challenge because it has the backing of a major game studio (EA's Respawn) that is known for making quality shooters, such as Titanfall. Plus, Apex Legends has a playful game design that breaks away from the military-based shooters like Call of Duty and Battlefield. This is one reason why Fortnite has dominated: It features unique, quirky, and humorous characters that appeal to male and female, young and old gamers alike. 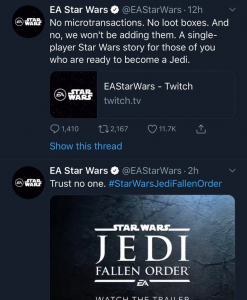 The stakes are high for EA. Fortnite grossed over $3 billion in profit in 2018, according to TechCrunch. Keep in mind, that $3 billion is purely from in-game spending. That means the average Fortnite player spent about $24 last year on in-game cosmetic items, such as character emotes and outfits. Epic Games, the maker of Fortnite, has clearly mastered the free-to-play model of giving the game away for free and then making money from in-game content. This is a particularly lucrative model when you have a quality game that many people want to play. 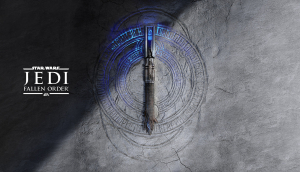 EA has generated 42% of its total revenue, or $2.2 billion, over the last year from live services (or in-game spending) across all of its games, but the problem is that the company is still dependent on selling games for $60 up front and, therefore, limiting the potential size of its audience reach. As more gamers spend time playing free-to-play titles that are continuously updated with new content and don't cost a dime to play, the big game companies have been caught flat-footed. 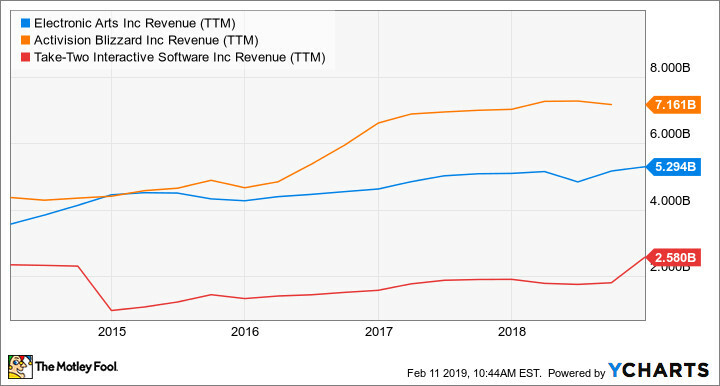 Sure, they still generate billions of dollars of revenue every year, but EA's revenue not only isn't growing, but it also started to show signs of tipping over in the last quarter. Fortnite's $3 billion in revenue is money not going to Electronic Arts and Activision Blizzard. EA Revenue (TTM) data by YCharts. Overall, the successful release of Apex Legends shows that all it takes is one game to turn around investor sentiment. Investors have been concerned about Fortnite's cannibalization of the industry, but the big game companies have plenty of resources to respond with their own battle royale experience, and Apex Legends is EA's first response. 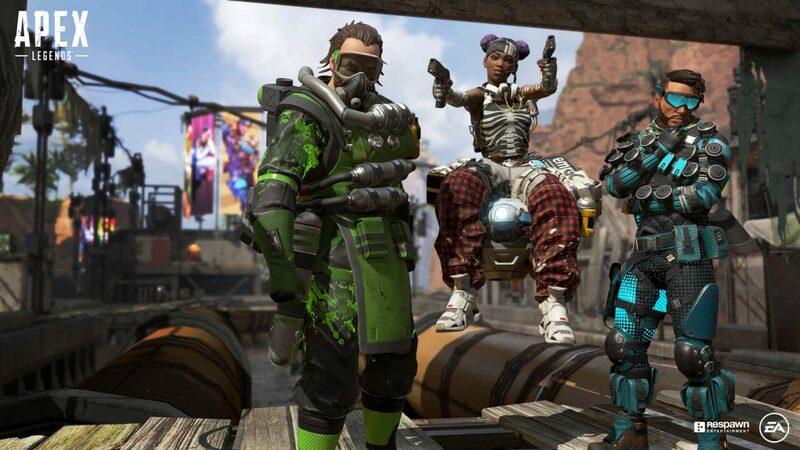 It's early and difficult to predict whether Apex Legends will maintain its popularity, which would be akin to trying to guess which new video upload on YouTube will be the next to go viral. No one predicted Fortnite would take over the industry a year ago. This time last year, PlayerUnkown's Battlegrounds was the king of battle royale shooters, but then Fortnite came out of nowhere and took the mantle. Nonetheless, it should be encouraging to investors that EA has released a free-to-play battle royale game that is generating a lot of buzz and could produce a significant profit for the company in the next few years. David and Tom just revealed what they believe are the 10 best stocks for investors to buy right now... and Electronic Arts wasn't one of them! That's right -- they think these 10 stocks are even better buys. John Mackey, CEO of Whole Foods Market, an Amazon subsidiary, is a member of The Motley Fool's board of directors. John Ballard owns shares of Activision Blizzard and Amazon. The Motley Fool owns shares of and recommends Activision Blizzard and Amazon. The Motley Fool recommends Electronic Arts. The Motley Fool has a disclosure policy.